Now that I have baby number three on the way, the appeal of modern cloth nappies is growing in line with my bump. The money you can save and the landfill you can eliminate is widely recognised, but I’m only just realising the compounding effect of those factors when you add more kids to the equation. While everything else about the idea of having three kids is freaking me out, my budget and social conscience is breathing easy. 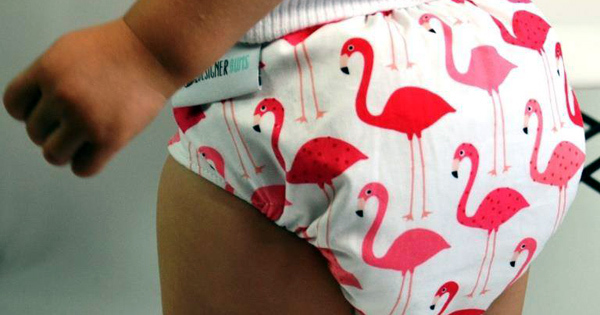 If you are only just joining the modern cloth nappy movement – or would like to spruce up your collection with some adorable, limited edition designs – then we have to introduce you to Designer Bums. Designer Bums are proudly Australian owned and designed by work-at-home mum, Carla Schwef. Originally sewn in her Melbourne home, the nappies have been in such high demand that she now spends her time sourcing premium materials and ethical manufacturers to ensure the original philosophy of protecting the environment and baby bottoms is carried out in a way that can reach a much bigger number of cloth-nappy loving parents. Designer Bums modern cloth nappies work just like disposable nappies. They come in one size fits most (OSFM) and can be adjusted with snaps or velcro to fit each individual backside as they grow. Made with a 100 per cent cotton outer and silky soft, suede cloth liner, Designer Bums nappies keep baby’s skin dry and comfortable. They use a tri-layer bamboo insert that Carla tells us is made from the finest bamboo fleece available and is super absorbent. The fashionable and fun designs that are available really set this brand apart from other modern cloth nappy companies. With a house full of boys, I love that there are so many gorgeous gender neutral and boy designs available. I’m rather partial to the Forest Friends (pictured above right), Love Giraffes and Tribal Triangles designs myself but the Flamingo Festival (pictured below) is also pretty funky and very popular. Priced at $34.95 each, Designer Bums also come in value packs. You can check out the entire range and purchase your own at Designer Bums.